I wasn’t planning on writing about Crows Zero (2007) but, thanks to a vicious cold, I’ve recently been on a Japanese drama and film binge and watched it’s sequel Crows Zero 2 (2009). So then I had to go back and watch the first film again which shows just how much I liked it. Absolutely. It was probably one of the best films I saw this year. Based on the manga series Crows by Hiroshi Takahashi, Crows Zero is an original prequel written by Shogo Muto and directed by Takashi Miike and features some of the original characters from the manga but is essentially a different beast. And it’s a beast of a movie, but one with a heart. Starring Shun Oguri and Takayuki Yamada, Crows Zero opens with the arrival of Genji Takiya, son of a Yakuza boss, at Suzuran Boys High School, one of the toughest and most violent schools in town. Genji has a difficult relationship with his father and to prove his worth, he must take on and unite the warring gangs at Suzuran, something that has never been done before. His ultimate goal is to fight Tamao Serizawa, the monster third year student who is currently the strongest boy in the school. Like with Gokusen, I don’t know why I like watching dramas and films about delinquents so much. Maybe when I was growing up, they seemed to have a thirst for life and freedom which I never sought in the simple and happy environment I grew up in (not that I’m complaining – what with all the travelling, I had a pretty exciting childhood). Maybe you’re just drawn to something which you’re not. I definitely wasn’t a delinquent, so maybe I just find it exotic. Takeshi Kitano (or Beat Takeshi as he’s better known in Japan), famous Japanese comedian and film maker (Sonatine, Brother, Zatoichi) once said that he makes films about the yakuza because they are the only people that embody the Japanese spirit (kokoro) which has vanished from modern Japan. I don’t agree with him (because the underworld, when you come down to it, is criminal and feeds off people’s fear and suffering, plus they kill people), but I do understand what it is he is trying to say. These people (in the fictional world) live whole heartedly and give their all. Every day is life or death for them. There is no mask one wears in public and private. In the same way, when I watch dramas and films about high school delinquents, they tell me about the problems in Japan’s society, and how the young people try to understand and overcome the issues thrust upon them by the adult world. And they do it with all their being, maybe not in the best or politest way, but in an honest way. Like crows, these boys follow their own rules, freely and not bowing to a society that despises and refuses to understand them. Pondering this issue, I began to wonder why so many Japanese tales are set during adolescence as opposed to the West where people are more focussed on life as an adult. And I realised that it had to do with freedom. In Japan, you are essentially free to follow your dreams and live freely until graduation, only having to follow the rules set down by your parents and school. Upon graduation, you become a shakai-jin, a person of society, and must now live within the rules of society, which are numerous and severe. You join the working masses and most people give up the dreams of their youth. In the West, it is only once you graduate that you can earnestly begin to pursue your dreams. The working life is more flexible and people can shake off the ties of family and school. I’m not saying that there are no societal rules in the West, but that people don’t necessarily feel as shackled. Maybe I’m simplifying this too much, but it’s why I feel that there is always this nostalgic view of school life, this yearning for a simpler time filled with hope and dreams. What they call their seishun jidai. Anyway, back to Crows Zero, we follow Genji as he tries to beats his foes into submission and gather allies. In the process he is befriended by a low-level yakuza named Ken, a likeable fellow who dropped out of Suzuran many years ago. He shows Genji how to make allies by earning their respect and friendship. However Ken belongs to a rival yakuza family and is ordered to kill Genji. Unable to kill his friend, Ken visits Genji’s father and returns to his own boss to face the consequences. Genji also meets Ruka, a singer at the dive he frequents, with whom he forms a tenuous friendship. When Ruka is kidnapped by one of Serizawa’s gang, all out war begins, and Genji and Serizawa must battle it out to see who is the strongest. 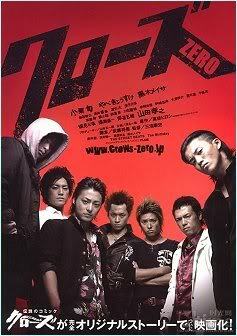 When I first watched Crows Zero, I was struck by the violence and the amount of fighting in the film. But it melts beautifully into the story of Genji and what he learns about friendship, respect and loyalty. 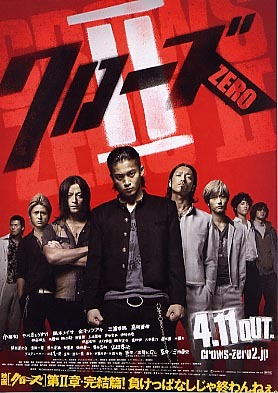 With Crows Zero 2, however, there was a lot more scenes of violence and a little less story. Crows Zero 2 is set one month after and begins with the release of an ex-Suzuran student from juvie. Upon his return to town, he is chased by a gang from Housen High School, a rival school whose leader he had stabbed and killed and for which he did time. He flees straight into Serizawa and his boys, and when Genji turns up, he inadvertently breaks the truce between the two schools culminating in a dramatic fight to avenge the murder of the Housen leader. In the meantime, Genji’s father is gunned down and Genji’s world slowly falls apart as he tries to deal with his complex feelings for his father and the heavy burden of being the leader of his group and trying to gather support for the fight against Housen. For someone who has always fought alone, Genji must learn to trust the people around him and work as a team. It’s still good, but not as good as its prequel. The best thing about these two films is Shun Oguri who plays Genji and Takayuki Yamada who plays Serizawa. They outshine everybody and deserve the critical attention they both received for their roles. Oguri won the 17th Japan Movie Critics Awards for Best Actor for Crows Zero and Yamada was nominated for his supporting role for the 50th Blue Ribbon Awards. Even if violence is not your thing (and it really isn’t mine, although I like a bit of kung fu and kickboxing), if you give Crows Zero a go, you might be pleasantly surprised. But you’ve caught my attention on this one. Might try it out some time.. I know what you mean about ‘Japanese dark’, it goes to places you’d rather not know… rather like the novels of Natsuo Kirino. I am constantly fascinated by the many conflicting facets presented by Japan and Japanese culture. I wholeheartedly agree that Yamada was nothing short of awesome in these flicks, although I was less impressed with Shun’s performance. I guess it really depends on your frame of mind when you watch something. But then again, I have a real soft spot for Japanese high school delinquents in mangas and dramas^^ However, I do think the violence was pretty excessive and not for everyone’s taste. Thanks for linking.